Joe Sacco’s wordless, 8 metre long panorama of the first day of the Battle of the Somme is a harrowing and deeply moving visual and literary representation of war. Titled The Great War, Sacco’s drawing is a detailed piece, showing the people, the horses, the weapons, the aeroplanes, the landscapes, the trenches and the gore of the Battle of the Somme. There are hundreds, if not thousands, of individual faces drawn into this piece, each of them offering some semblance of individuality and an essential humanity. On the first few plates of the work, men walk towards the Somme valley, optimistic, happy and exited. There is dancing and joking and a real sense of hope, of expected victory. As men piss while distant artillery shells explode over the German lines, as night falls and most soldiers are forced to stand sleeping upright, as bayonets are attached to all the guns in their hands and as they climb up, line up and walk out into No Man’s Land only to be shot to pieces, dead or wounded, as men are herded onto stretchers and into quickly-built hospitals or hurried graves, marching in the background, towards the conflict, is always another line of fresh men ready and expected to be crushed and destroyed under the terrifying might of the enemy artillery. Sacco’s drawing is precise and tense. His use of light and dark is impressive, the deaths and wounds he has drawn are riveting in their frequency. This image, this huge, long, image, is impossible to look at in its entirety at the same moment, but nor would one want to. It tells a story, there is a clear narrative, from the general at one end through to the graves of the soldiers at the other, it is uncritical in all ways but the acknowledgement of the barbarity of war. The German fighters are not seen, their trenches distant – at first submerged in the smoke of bombardment, later hidden behind the bullets and the shells they were throwing at the British. The Great War is extreme in its violence, but so was the Battle of the Somme. It is unrelenting in its depiction of horrible things happening, of the loss of limbs and facial disfigurement, of horses being shot, of men being forced to run towards an almost certain death. It is bleak, perhaps, in some ways, but it is, throughout, deeply humanising. The piece is packaged with a booklet that contains an essay by Adam Hochschild, who lists some of the facts, figures and details of the people and places depicted in the image. He uses statistics, but also writes of individual regiments, of individual men, of individual people, and this essay is almost as heavy-going as the panorama. Sacco provides some annotations in the booklet, too, drawing the reader’s attention to certain objects or instances in his drawing, but I’m not really certain either the essay or the artist’s notes were necessary. The Great War, as a panorama, shows a strong and clear narrative of an upsetting, important and harrowing historical event. The image is strong enough by itself – people died here, thousands of them, in horrible ways. This document humanises them, by visualising their faces, their bodies and their wounds. 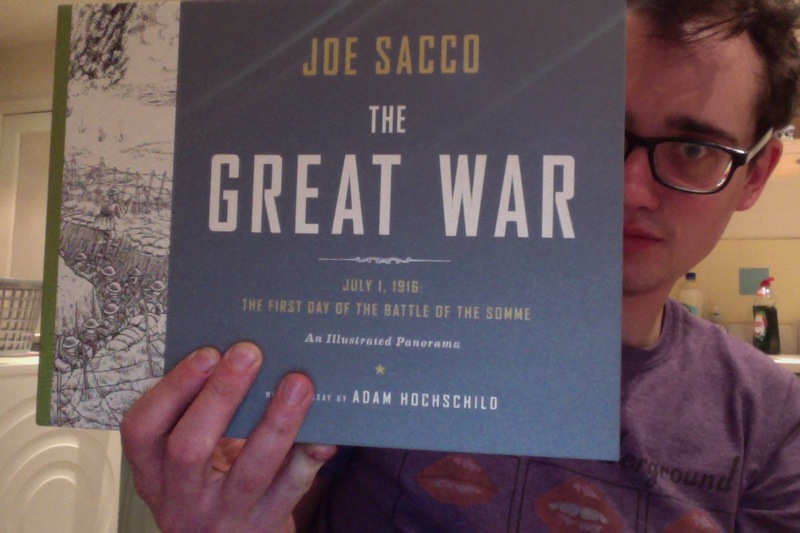 Joe Sacco, again, has drawn in such a way as to offer an upsetting and unique perspective on a widely-discussed topic. This, and everything else I’ve read by Sacco, comes highly recommended.